Kunshek Chat & Coal Co.
Henry Kunshek bought his first truck in 1945 upon his return from Europe after serving his country in World War II. He had very humble beginnings leaving his childhood home to find work with nothing but cardboard tied to his feet with bailing wire. He worked as a farm hand for a short time before the war began. During that time he met Julia Verardi and they married before he went overseas. Being very frugal he loaned money to fellow soldiers and charged interest, standing at the head of the line on payday to collect. War Bonds were sent home to Julia, trusting that she would not spend the money, and upon his return the money was used to purchase a flatbed pickup. Henry started hauling trash that had accumulated during the war and soon got into other areas hauling coal from the large coal fields of Southeast Kansas, fruit, and almost anything that would fit on his pickup. Hauling bulk material was much more difficult back then as the load had to be shoveled on by hand as well as shoveled off. Henry was very happy when the first cable-dump trailers and then loaders came along, and in his later years could not tolerate someone complaining about not having air-conditioning or a radio in their truck after having the experiences that he endured. He was somewhat of a local legend and was known for his strength most notably being able to throw a mounted tire into the back of a dump truck. Although trucks were much smaller back then, that was a feat none-the-less. Being a true entrepreneur, Henry, along with the financial guidance of Julia, operated many companies over the years. With trucking as their mainstay they operated several rock quarries, a road paving company, a gas station, and owned multiple rental properties. 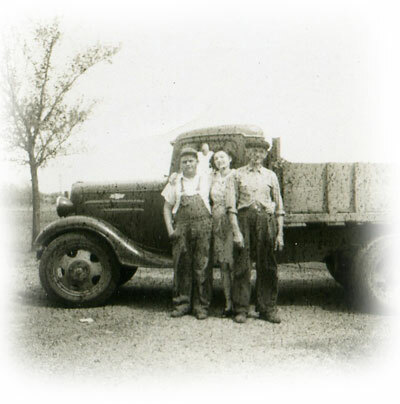 Their son Robert was a part of the company from day one and spent many a night fixing flats after supper. He started driving a truck at a young age and remembers being pulled over in Missouri when he was thirteen sitting on a phone book so he could see over the steering wheel. The trooper told him to go home and not come back to Missouri until he was legal to drive. Robert took over the company in 1990 after Henry was diagnosed with Alzheimer’s disease. Not being able to manage all of the companies by himself, Robert sold everything but the trucking business and set his sights on building it from a ragtag mix of eight trucks to the excellently maintained and operated twenty-five unit fleet he operates today.